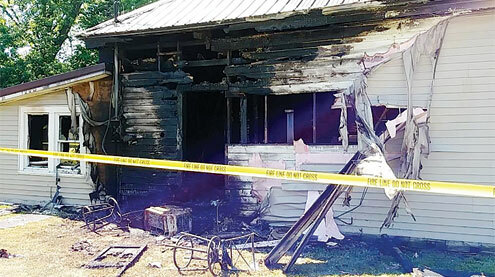 The Bowling Green Fire Department was dispatched to a residential fire at 311 S. Cuivre Street on Sunday, May 27. Firefighters and apparatus arrived on the scene within six minutes of being dispatched and arrived to heavy smoke and flames. “Firefighters were able to perform a quick interior and exterior attack on the fire and had the fire controlled within 20 minutes of being on the scene,” noted Bowling Green Fire Chief Adam Mitalovich. He noted in a press release that firefighters stayed several hours performing salvage and overhaul operations to ensure the fire was completely extinguished. A total of 11 firefighters responded and three pieces of apparatus were dispatched by the Bowling Green Fire Department. Mitalovich said that due to the excessive heat the department received assistance from the Buffalo Township Fire Protection District and Eolia Community Fire Department. Firefighters were also assisted by the Bowling Green Police Department and Pike County Memorial Hospital EMS crews. Mitalovich said the owner was home at the time of the blaze and was able to escape with two pets. No injuries were reported.